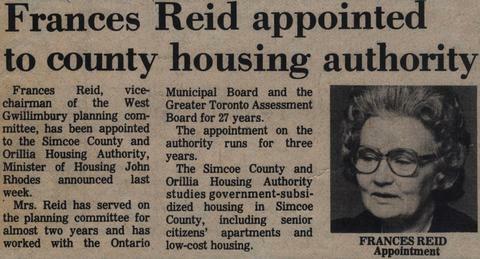 "Frances Reid, vice-chairman of the West Gwillimbury planning committee, has been appointed to the Simcoe County and Orillia Housing Authority, Minister of Housing John Rhodes announced last week. 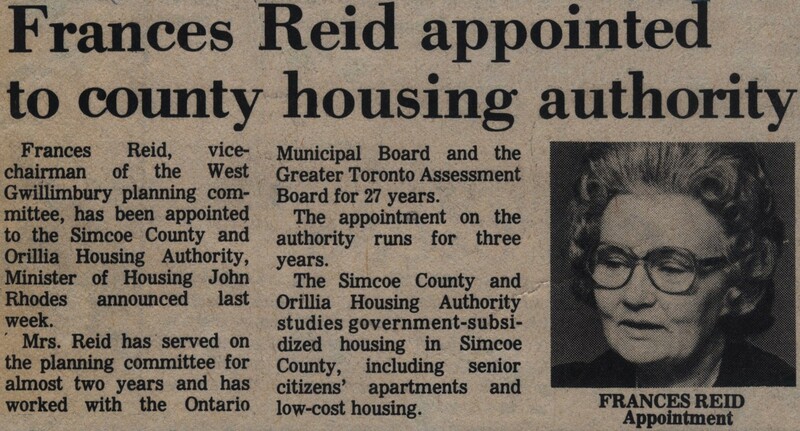 Mrs. Reid has served on the planning committee for almost two years and has worked with the Ontario Municipal Board and the Greater Toronto Assessment Board for 27 years. The appointment on the authority runs for three years. The Simcoe County and Orillia Housing Authority studies government-subsidized housing in Simcoe County, including senior citizens' apartments and low-cost housing."